Create, revise, interlink and publish documents of any file type for easy team work. You need a versioning system to manage your documents in order to comply with ISM, ISPS, TMSA, and in general with the SMS code. 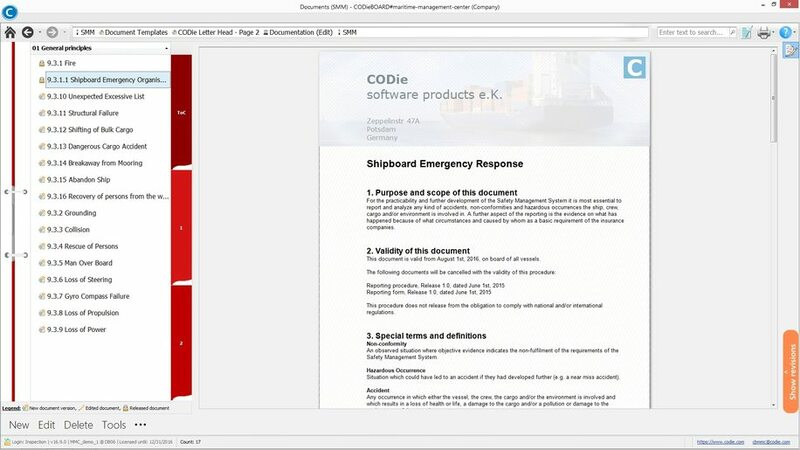 This is exactly what CODieBOARD# maritime-management-center (MMC) Compliance is, it is a versioning and publishing tool, which manages all documents related to vessels in your company. The software doesn’t mind what you are using it for, you can create any type of document (e.g. ISM Manuals, checklists or circulars). The Items are displayed in shelves, folders and chapters, just as they are in your office! See how our ISM / ISPS management can help you! With two clicks you can interlink document folders to vessels and fleets, making it easy to distribute your latest publications. After document release, files are transferred automatically to your ships. Captain and Chief receive alerts about new and unread documents and can bring in their experience through reviews. Our ISM management system comes with audit-proof versioning for revision control. For easy comparing of document versions you can use change tracking, leave comments and version notes. 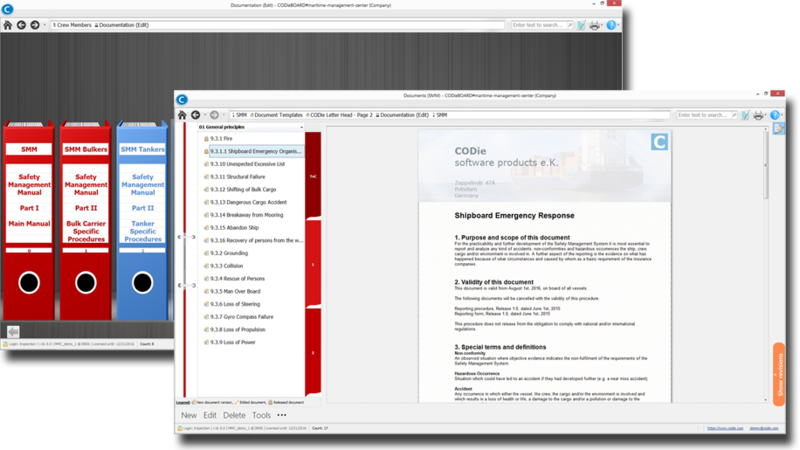 The maritime-management-center editor for documents, checklists and forms has powerful features. Use fields automatically populated with information such as date, IMO number, publisher etc., and you can also hyperlink to text within other documents. Use advanced search techniques to sift through the content of all documents simultaneously. Or simply search for all documents containing changes, and their publishers or release notes. In addition to internal documents you can also handle all common external file types such as xls, pdf, and docx for versioning. Support your QM Management with our DMS! It is fully integrated with our Smart Fleet Reporting, which enables you to add forms and checklists, e.g. NC reports and internal audits. Updating your documentation was never easier. Afraid of change? Don't be! We can convert your data! Due to the centralized database of our CODieBOARD# maritime-management-center you have all documents in one place. These documents are then used in other modules like Smart Reporting and Planned Maintenance. Changing the main document will change it automatically in all locations, saving time and effort. CODieBOARD# MMC has a DMS module for managing, e.g. ISM, ISPS, TMSA, ISO9000/14000, and fleet circulars. It takes care of the document flow between shore office and ships. Our maritime software provides an easy way to handle all your documentations in according to class and flag state requirements. The document management section is inspired by the setup at your office work place. Like your office, in MMC shelves are the central storage objects. In these digital shelves, there are no loose papers lying around, everything is neatly sorted into folders. Every shelf can contain multiple folders, which are visually represented as “real” folders, just as you know them. The folders serve as categories for the documents they contain. To allow optimal sorting the folders themselves can contain chapters and sub-chapters. It would be quite a hassle to interlink each and every document with each and every ship. Therefore, you do not link to documents but to their folders. As you can also interlink folders to whole fleets, the initial setup of distribution can be a one-click scenario. Each time you release a new version of a document, all the document folder’s interlinked vessels will be updated automatically at once. The client version installed onboard the vessel notifies its users about new unread versions. Within the new document all changes are highlighted. The maritime-management-center will warn you if the automated sending would cause high data usage (parameters defined by you). You may then decide whether to send a CD/ USB stick to the vessels, or to allow the transfer. Onboard the vessel, only the latest document versions are made available in order to avoid confusion. If you are going to create a new document, for example a circular, you do not have to start from scratch. You can use a pre-defined document header, for example one containing your company logo, and you can use any existing document as template. Additional form fields insert a range of data like vessel name and date automatically. As well as documentation management, a norm matrix manages all documents which belong to norms like ISO 9001. This allows you to assign documents to specific norms and gain an overview of the assignments. For example, a bunkering checklist might be considered as part of the ISM system and in addition it may belong to ISO 9001, as the checklist is a standardizing processes. We offer full handling of crew, certificates and payroll. A third-party login gives your agencies the ability to update their crew. Build your own reports! Managing your fleets findings, incidents, claims and many more was never easier.